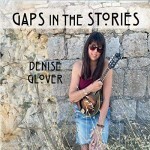 The music of singer-songwriter Denise Glover, from Seattle, emphasizes rootsy original material with poignancy and soul. Besides singing, Glover plays guitar and mandolin. Her bandmates include Julian Smedley (guitar, violin, viola), Cary Black (bass), Bob Knetzger (Dobro, pedal steel) and Jeff Bush (percussion). The band gives us a passionate acoustic folk and Americana repertoire emphasizing prolific contemporary messages, thoughtful arrangements, graceful instrumentation, and relaxed vocals.